All volcanologists must be a little crazy somewhere deep down inside. Frank Alvord Perret was perhaps the craziest, or so it seems to a layman. Why else would he stick a crowbar down almost the length of his arm into the brightly glowing fissure of an erupting volcano and then pull the bar out again…just to test a hypothesis? At the time of the writer’s visit, the lava was incandescent, but not liquid, on the inner walls of fissures overstanding the main vents of Chinyero, where the electric pyrometer showed temperatures ranging from 750 degrees to 860 degrees Centigrade. Convinced that these surface temperatures could not be due to conduction from below and that, instead, they were maintained by the ascending gases, the writer was able to demonstrate this by experiment. A place was found where the fissure could be obstructed by the introduction of an iron crowbar, horizontally, at a meter below the surface, whereupon the flow of gas was stopped and the incandescence rapidly died out. On the withdrawal of the bar, the gases re-ascended and gradually kindled the inner walls to a bright red glow, as before. — From “The Volcanic Eruption at Tenerife in the Autumn of 1909” (PDF). 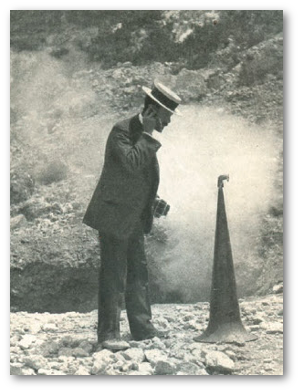 By all accounts, Frank Perret was also one of the best volcanologists ever. On the Caribbean island of Martinique for Pelee’s 1929-1932 eruption where, among other exploits, he joined the elite – and small – circle of very lucky people who have been surrounded by a pyroclastic flow and survived. Not bad for an American electrical engineer who had been sent abroad for a rest cure. Born in Hartford, Connecticut, two years after the end of the Civil War, Perret attended the Brooklyn Polytechnic Institute but dropped out to work for Thomas Edison. 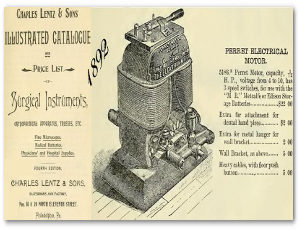 The late 1800s were seeing a new market develop for electrical appliances, and the young man taught himself electrical engineering. When Edison shut down his New York lab to break a strike, in 1886 Perret and another former Edison employee founded the Elektron Manufacturing Company. It did well. By 1893, he had invented an elevator motor and was doing well enough to exhibit the company’s products at the Chicago World Fair. All that intensive work had a high cost. Perret burned out at age 35, in the spring of 1902, and went back home to live with his family. This was done more out of a need for refuge than for financial reasons, since he had income from his electric motor patents. Perret’s doctor prescribed rest and a total change of scenery. The aftermath of a horrific natural disaster wasn’t what he had in mind, but Frank went to Martinique to view the ruins of St. Pierre after Mount Pelee’s recent eruption. Then he went to Italy and rented a room in Naples that had a good view of Mount Vesuvius, the volcano that had destroyed and buried Pompeii. Based on these two visits after a nervous breakdown, it’s difficult to say whether volcanoes or disasters had the most fascination for Perret. In any event, he became acquainted with Professor Raffaele Matteucci, director of the government’s volcanological observatory on Vesuvius, who has been credited with sparking Perret’s lifelong interest in volcanology. Matteucci allowed the young American to work with observatory staff. 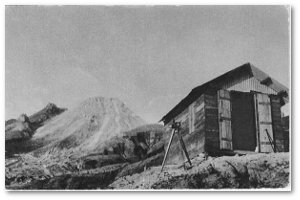 Perret introduced the innovation of documenting the volcano’s activity with photographs. At the end of 1905, he was made an unpaid honorary observatory assistant. As an assistant, Perret slept at the observatory, which sat on the flanks of Vesuvius. One night in February 1906, he thought he heard a buzzing sound. You or I would have said, “Huh, that’s weird,” rolled over and gone back to sleep. Frank Alvord Perret clamped his teeth on his iron bedstead and noticed that the sound increased. He had discovered harmonic tremor, a seismic signal sent by moving magma and a precursor of an eruption. Perret invented equipment to record the strange signal (thus saving wear and tear on his teeth). When Vesuvius finally erupted in April 1906, he and the observatory director remained at their posts throughout, monitoring the eruption and sending bulletins to the officials and people in nearby Naples. Perret received recognition from the Crown for this. He then continued to study Mount Vesuvius for 15 more years. In 1906, Frank Perret met Thomas Jaggar, of the Massachusetts Institute of Technology, on the flanks of Vesuvius. Jaggar was interested in volcano observatories and visiting volcanoes worldwide. Jaggar would visit Japan in 1909 to see how volcanoes were monitored there, and in Honolulu, learn of local interest in setting up a volcano observatory on Kilauea. Once back in Boston, Jaggar was in favor of setting up a volcano observatory in Hawaii, where volcanoes erupt frequently but relatively safely and the weather is mild enough for year-round outdoor work. He had difficulty convincing MIT to fund it. By October 1910 he was able to purchase some equipment on his own and ship it to Honolulu. Then in 1911 Frank Perret, who was by now very well known, came to Boston on a lecture tour. Jaggar was unable to follow his equipment to Hawaii, so Perret agreed to go in his place and set up an observation post on the rim of Kilauea above the lava lake. 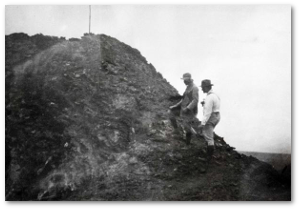 Perret arrived at Kilauea on July 2, 1911, and immediately got to work, constructing a hut for observers and instruments, as well as stretching a cable over the lava lake from which instruments could be lowered to measure lava temperatures. Up until this point, geologists hadn’t been able to isolate and identify even a single mineral from lava. Perret’s temperature measurements at Kilauea helped earth scientists find dozens of different minerals in the melt. Jaggar was supposed to join Frank Perret at Kilauea but was unable to come during the rest of 1911. Perret had to return to Italy in December, so the Kilauea observation record was interrupted until Jaggar finally got there after the first of the new year. 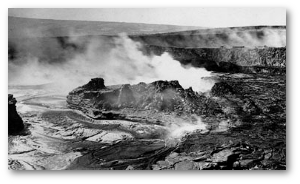 Kilauea has been continuously observed ever since, although there is some disagreement on whether the Hawaiian Volcano Observatory got its start in January 1912, when Jaggar arrived, or in July of that year, when he got his first paycheck. Who knows when HVO would have been set up, if not for Frank Alvord Perret. In 1929, Martinique’s Mount Pelee erupted again. 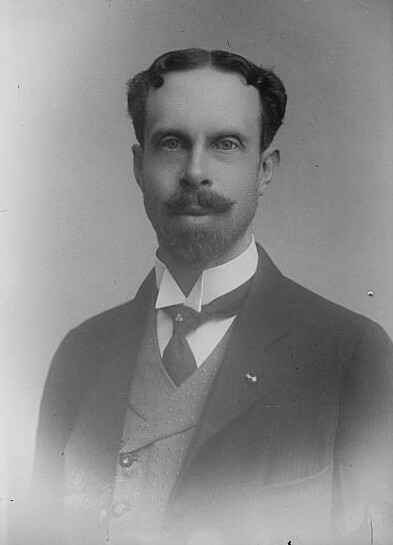 Frank Perret moved to the island of Martinique and, in 1930, built a hut on one of the erupting volcano’s ridges – a good but terribly dangerous vantage point to study pyroclastic flows. 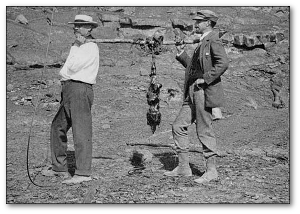 It was more serious field research that would result in another book, but Perret’s work at Pelee during this eruption became legendary. He was … the first to report the sound pyroclastic flows make as they move at hurricane speed: they make no sound at all. This eerie silence of massive clouds of moving rock is fact. Perret thought it was because its heat kept each particle separated from all of the others by hot air or gas. One day in 1930 a lava dome up on the summit collapsed. 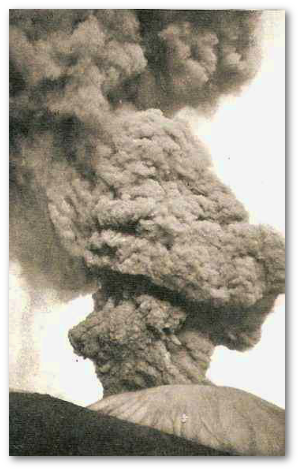 The resulting pyroclastic flows almost killed Perret. A huge spine had grown up near the west side of the dome summit. It was unstably poised and its fall seemed imminent. Just at the close of the swiftly passing tropical twilight, in the dead calm between day and night winds, an unusual sound brought me to the cabin door. The whole mass had fallen, leaving a great scar on the dome from which poured forth an ash-cloud of inky blackness, expanding upward as it rushed down the talus slope like a nu?e ardente. At the same instant an explosion on the eastern summit shot out a second avalanche with rising cloud white as snow; two mighty parallel columns, ominous, terrifying, moving straight toward the station. I shall not attempt to describe all the sensations I felt, nor the thoughts that swept through my mind at that moment. My first thought was of instant flight. With a distance of 2.5 kilometers between me and the crater, it might be four minutes before the clouds reached me, but a moment’s reflection indicated that this could not be enough to escape the wide path of the cloud. I decided to risk the protection of the frail shack. Doors, windows, cracks and holes were hastily closed and the onset awaited. Escapes from many former perils helped to allay my fears, but there was still the thought that this might be my last. I recall a sense of utter isolation; awe in the face of overwhelming forces of nature so indifferent to my feeble self. The track of the avalanche lay to the side of the station or these lines could never have been written. The chief dangers were heat and gas from the cloud. There was still a minute left. I peered out from the rear of the station. A sublime spectacle! Two pillars of cloud a thousand feet in height, apparently gaining in speed every instant and headed straight for my shelter. As I darted within, the blast was upon me-not a terrific shock as the reader might think, but swirling gusts of ash-laden wind, bringing a pall of darkness that might indeed be felt. The dusty air entering every crevice of the shack was hot but not scorching. I felt the gases burning and parching my throat and then came a feeling of weakness (carbon monoxide?). It all lasted for half an hour, but it was nearly an hour before the feeling of suffocation was relieved by a kindly wind. Yes, Frank Alvord Perret, trapped in a flimsy cabin with two massive and fiery death clouds racing toward him, peered out and admired the sublime spectacle. Well, he did call that right. Here is a single, small flow on another Caribbean island. Perret lived for another 13 years and worked in the field most of that time, but his close call on Pelee is a perfect ending point for this article. Frank Alvord Perret was very remarkable man. As an earth scientist, he helped to lay the basis of modern volcanology, but he also never lost his ability to marvel, even in the most dire moments, at one of Nature’s greatest shows.